ONE Ala Moana is the pinnacle of world-class living. Adjacent to Ala Moana Center while Saks off Fifth, Target and Starbucks are conveniently below. One Ala Moana has a long list of luxury amenities and a great service team to help you. ONE Ala Moana provides resort-like amenities, such as infinity pool, cabanas, kiddie pool, hot tub, sauna, golf play room,fitness room, recreation deck, party room with kitchen, private theater room, BBQ grills, kids area, multimedia room, library, putting green, yoga/Pilates studio, massage room. ONE Ala Moana staff is stationed at the front desk for 24 hr to support you. Located right on Ala Moana Shopping Center, one of the top 10 largest shopping centers in the United States with a variety of over 350 stores and restaurants. Private elevator for resident's to use to access the mall. Relax and enjoy your resort stay at this newly built condominium. 1,252 sf of premium ocean and sunset views, fully-equipped kitchen with the high-end kitchen appliances. 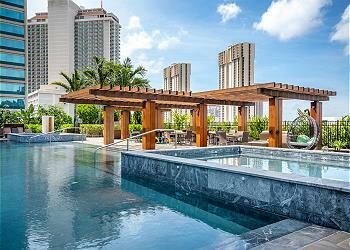 Located directly above the Ala Moana Center.